I’d like to say that the example above was a solitary display of some of the finest and purest tard parking there is to offer, but no; there are two more after the jump… all occuring on the same floor and all snapped this morning. But this one wins the toss-up prize for being equally egregious and ironic, what with the “small” and “cars” stenciled at the head of each of the two spaces this not small and not car behemoth is blocking. This structure adjacent to where I’ve been temping this last three months is actually the motherlode of such idiocy, a veritable hive of bad parking behavior from which no two spaces are safe from being straddled. While perhaps not openly encouraged, such proud displays of inconsideration, and discourtesy are totally if quietly condoned here. And on this my last day there I decided to catalog it and it took only a minute. Literally. Amazing. Rudeness is everywhere. Thanks for posting with the lp#’s intact! Then again the truly rude don’t get it. Duh – the last car is a BMW, so it gets to do whatever it wants (like not dirty its front with an ugly license plate) and the second car gets a pass because it is patriotic. See that ribbon magnet! The first car though, he’s in trouble. Might want to blur their plates to avoid problems later on. Yeah Fraz, I’m bummed the worst offender’s plate got lost in the glare. It doesn’t excuse the trucks, but they aren’t the only guilty parties in the photos. I’m not sure what problems I’m failing to avoid by leaving their plates unblurred, but I appreciate the thought D.
Ahh, but how do we know that the trucks weren’t there first and that the car drivers used the same rationale? Bad parking begets more bad parking. Incidently, I think we should start a movement to call SUV’s “minivans” again, maybe it will make them go away. A fine point DB and very true in regards to the other cars, but it still takes quite the pair of ballbearings to rationalize parking that way. Me, I woulda moved on up the line until I found a legit space I could fit in… which is just what I did. 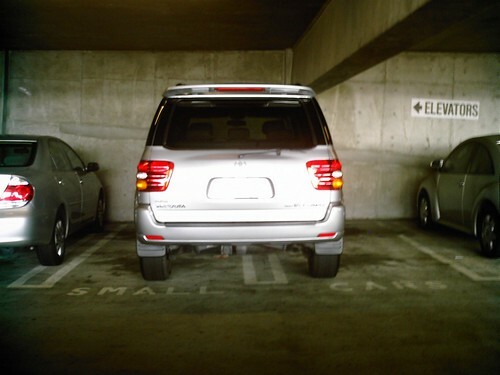 #1: The top car is still parked in a place clearly marked for SMALL cars. 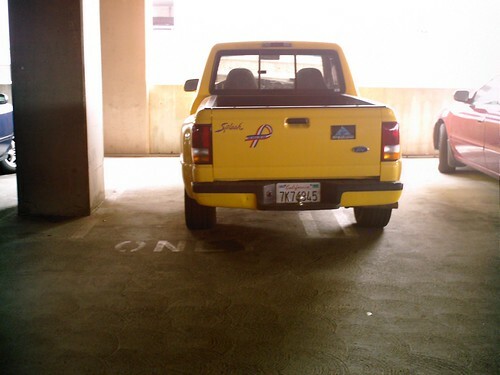 #2: The second car is next to a pillar, so there’s no excuse for taking up two spots whatsover. So excusing the bad parking on previous bad parking is moot in all but the last photo. Every time I see crap like this, I resist the temptation to key their car. If your car is so big or so precious that you can’t park it in a normal L.A. parking space, maybe that’s a sign that you shouldn’t be driving that car in L.A.
not to be the devil’s advocate, or anything…(I ride a motorcycle myself) but is that one of those garages where there is a disproportionate amount (esp. considering how much Angelenos love their oversized vehicles) of compact spaces? I think some newer garages squeeze ’em in as tiny as possible because the city requires they have a certain # of spaces for the building, and rather than build a big enough garage, they just cheat and make a bunch of tiny spaces. Right? City nerd? Pinky the way I remember it is that on any given level of this structure, the inside spaces on one side are designated for compacts, but the outside are all full sized so it seems there’s pretty much a 50-50 split. Ok… I have no idea what “trouble” the author could possibly be in for exposure a parking ‘tard. 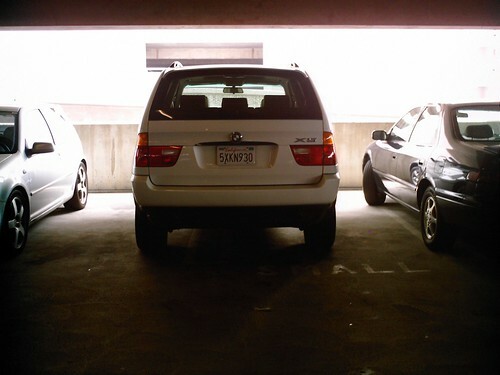 Not liable or slander…no false accusation there, it is what is….bad parking. Seen worse litigated and lost. And prior to the failing of text america I had hundreds over of these tards blogged with full plates and guess what no ramifications at all. Let’s not even go into the ‘tards who parked in handicapped spaces and shouldn’t have that I sent to the DMV. Urban Guerilla Warfare is never pretty. Building R9, by any chance? Looks just like the parking structure at my old job, and there was a lot of that going on. Karen, sounds like you’ve got it pegged, but there may have been a structure renumbering since you were there because I believe the office building I was in was called either LA1 or LA7. the iparklikeanidiot.com site sells “I PARK LIKE AN IDIOT” bumper stickers. good for the parking enforcement vigilante in all of us. Previous PostPrevious Sweatin’ Bullets: City Nerd spotted!